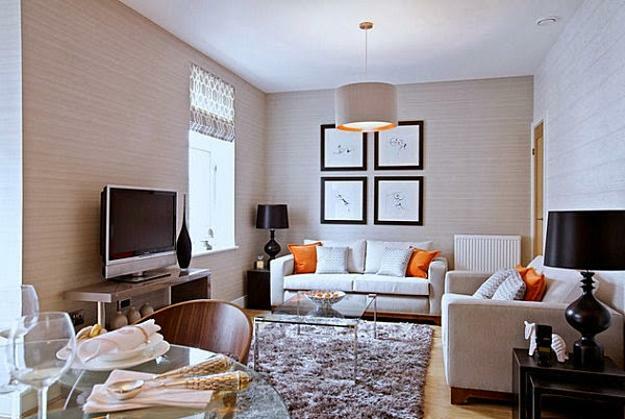 Small living rooms can be very comfortable and beautiful. Functional interior design, right furniture and decor accessories, bright lighting fixtures, light living room colors, and space saving ideas create bright, stylish, and welcoming rooms. Lushome collection of small living room designs shows how to maximize small spaces. Small room designs can feel charming and cozy. 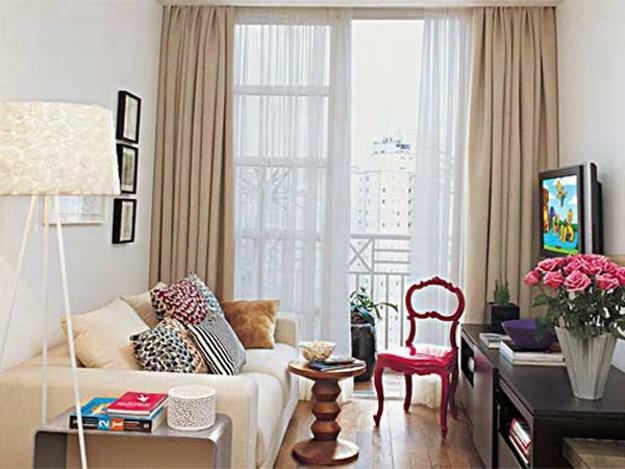 Tiny living rooms can be organized and furnished to look spacious and airy. Here are space saving ideas and interior design inspirations which will help you to create beautiful and modern living room design in your small space. Beautiful, inviting, and comfortable rooms will make you feel proud of your design and decorating projects. Good storage organization, light room colors, small furniture, and space saving layout plans turn small interiors into attractive and functional living rooms. These are elements that add coziness to small room design and give a contemporary vibe to small spaces. 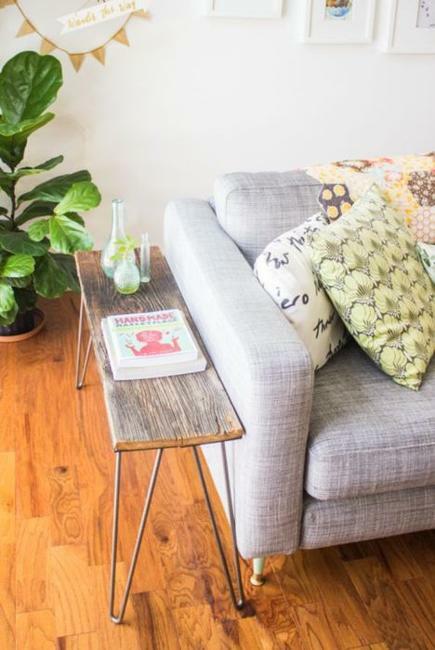 Lushome provides useful home staging tips, shares tricks, and space saving ideas for increasing small living rooms visually. 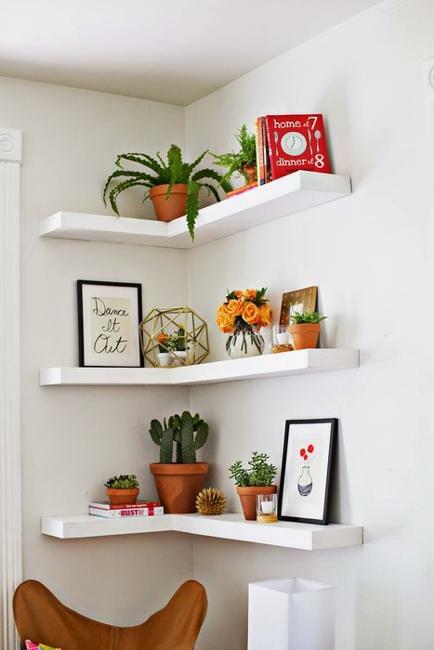 When it comes to design and decorating small spaces, a variety of mistake-proven techniques, home staging tips, and modern ideas come together to adjust small rooms to an individual lifestyle. 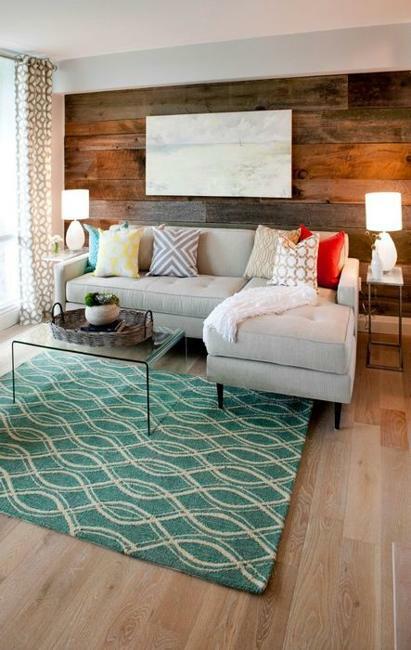 Home staging helps maximize small spaces for ultimate comfort and add a stylish look to beautiful, modern living rooms. 1. Change bulky living room furniture items for small and functional pieces. A large sofa looks great with little chairs in a different style, creating an original design and maximizing space in small living rooms. 2. 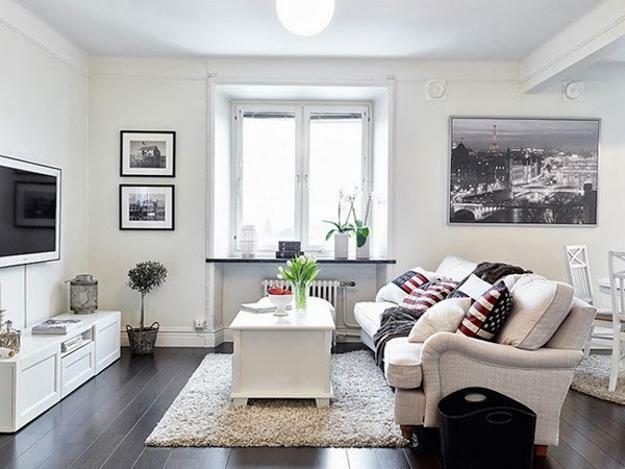 Corner furniture, cabinets, corner sofas and shelving units maximize valuable small spaces also. 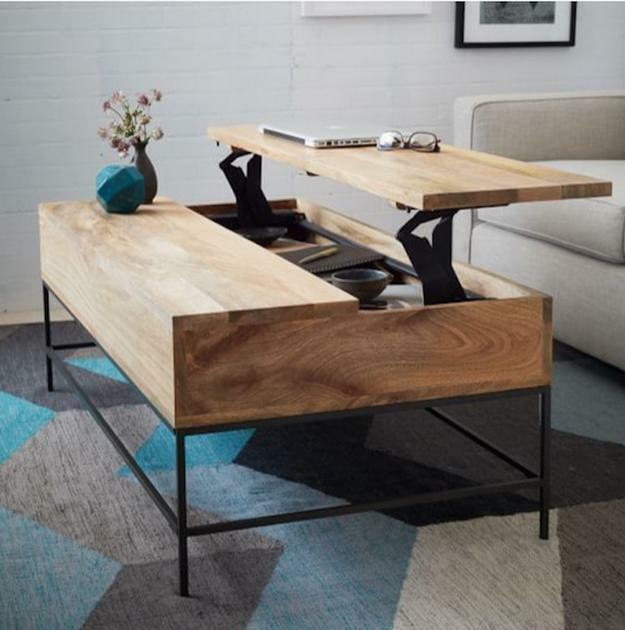 These furniture items are practical, modern solutions for small, but stylish living rooms. 3. 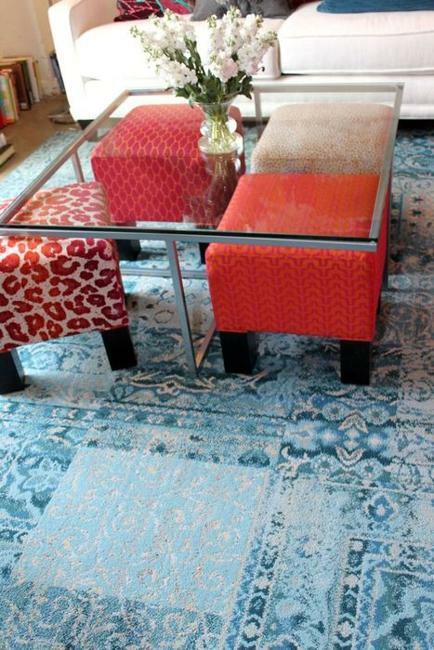 Ottomans and poufs are fantastic alternatives to traditional seats. They provide additional seats and footrests. 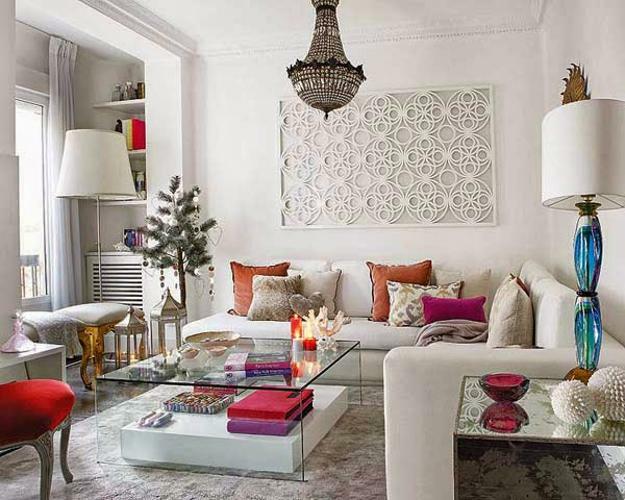 Practical ottomans and poufs are fabulous items for space saving in small rooms. 4. Transformer furniture is one of the best design ideas for small spaces. Also, built-in storage shelves and drawers improve traditional living room designs and offer a great organizing solution for small living rooms. 5. Space saving furniture, handmade, simple, customized furniture in small sizes take little space without compromising functional design. Rectangular geometric shapes maximize small spaces while bringing stylish furnishings into modern interior design. 1. 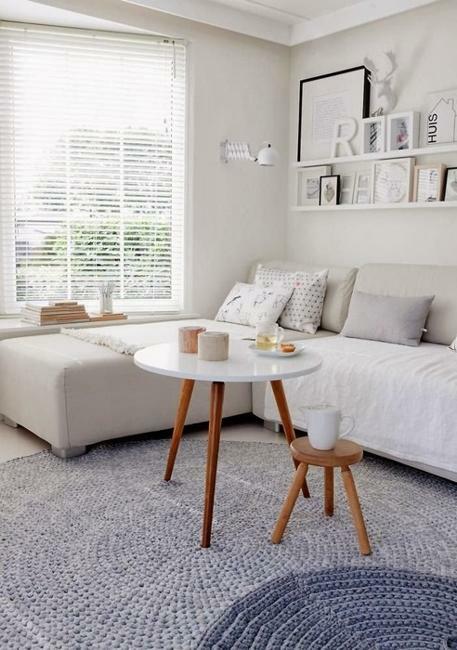 Use furniture with simple lines, transparent and glass top coffee tables for small room design and decorating. 2. 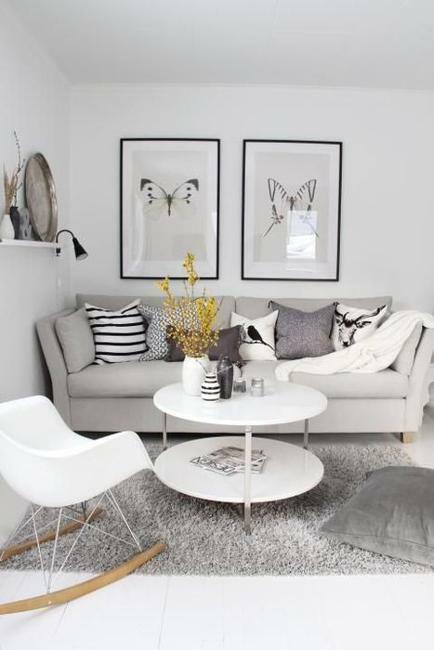 Select living room furniture and decor accessories in light pastels or neutral colors. 3. Emphasizing vertical lines in small rooms helps increase the space visually and balance interior design. 4. Good lighting stretches small interiors and adds an airy, fresh look to small living rooms. 5. Decluttering, space-saving storage organization and regular cleaning are three elements that keep small living rooms looking great, functional, comfortable, light, neat, and spacious. 6. Adding warm textures brings coziness into small spaces and create incredible effects of comfort and coziness that enhance modern living room designs. 7. Giving a touch of warm color to room decorating in light pastels creates beautiful combinations of modern interior colors and make even tiny spaces feel warm, cozy, and pleasant. 8. 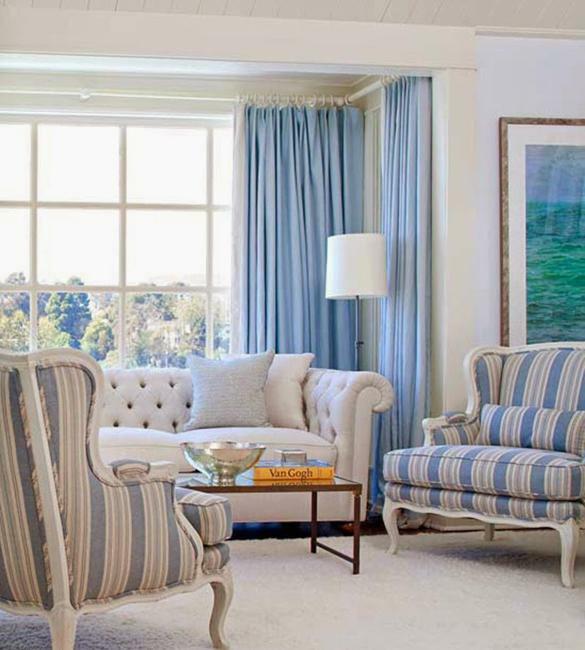 Use geometric patterns, like stripes, waves, diamonds, checks, and zigzags that help stretch small spaces visually. 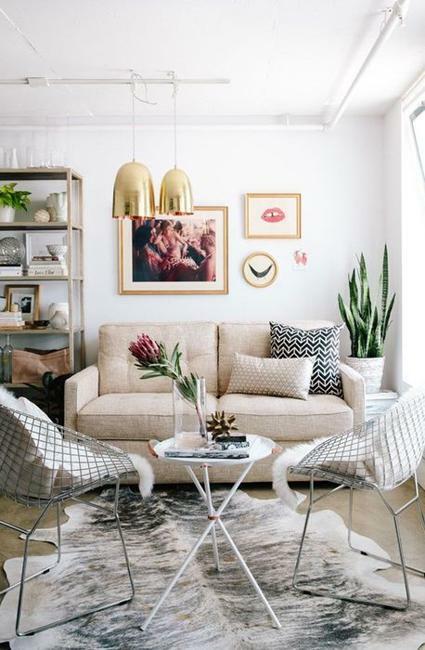 Long patterns and lines make small rooms look bigger and add stylish details to living room designs. 9. Posters and picture frames in dark colors create beautiful contrasts with light room colors. 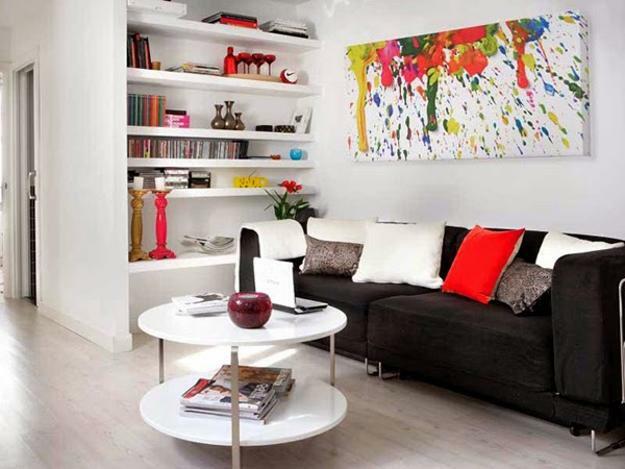 Contrasting colors stylishly accentuate interior decorating, bringing more interest into small spaces. 10. 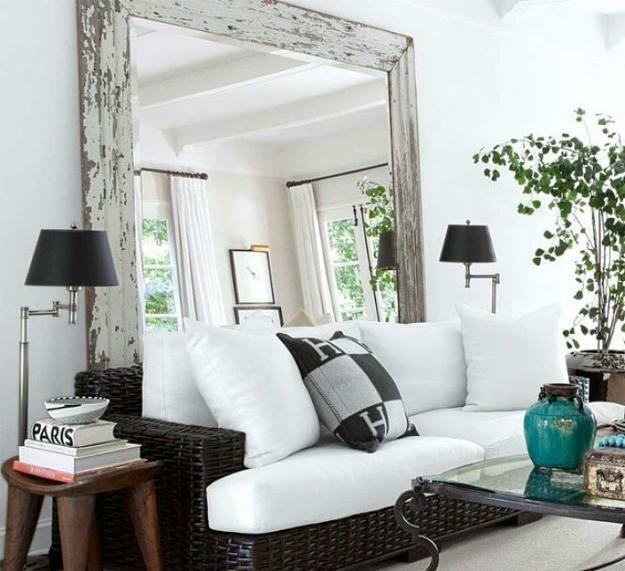 Large wall mirrors reflect more natural and artificial light into small rooms and create a bright, spacious effect in small rooms.